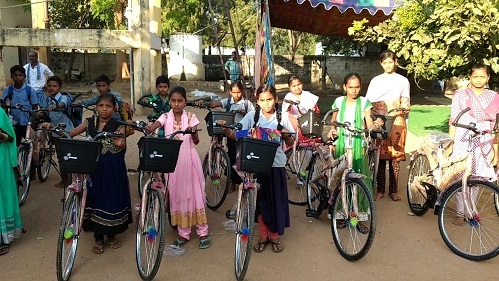 Bighelp has provided 20 cycles to students of Zilla Parishad Secondary School Rebbanpally, Adilabad district. Most of the students are attending the school walked 3 to 4 kilometers distance. Bicycles for students reduce travel time to and from school and improve educational out comes. By providing bicycles to children, especially girls, we can empower them with knowledge and ultimately, change the course of their lives. Mr. Mouli explained the formation, aims and activities of Bighelp organization and its present status briefly. Cycles were distributed to students by all the personnel presented on the occasion.